Is agricultural extension positioned to promote agripreneurship in South Africa? A shift from agriculture to agribusiness is an essential pathway to revitalise small-scale agriculture in South Africa and to make it more attractive and a profitable venture. The question is whether small-scale farmers can become entrepreneurs and how well is extension positioned to support farmers to foster entrepreneurship? There are two parts to entrepreneurship, the first is the managerial skills required to start and run a profitable farm business. Second is the "entrepreneurial spirit". Important to realise is that you cannot create an entrepreneur, but you can create the environment that will help them thrive. Governments and donors must invest in institutions and infrastructure that support them. Economic policies and financial incentives must be put in place to inspire a generation of agripreneurs. This paper aims to emphasise the importance that farmers must be linked to markets to take advantage of the opportunities arising along the agribusiness value chain. Successful entrepreneurship requires a strong enabling environment of which political will and leadership is important, but also strong private interest. Extension has a critical role to play in supporting farmers to develop their entrepreneurial skills through training and by providing technical assistance. Sub-Saharan Africa represents the "last frontier" in global food and agricultural markets. It has more than half of the world's uncultivated but agricultural suitable land, and in many countries the extensive water resources has scarcely been utilised. Although agriculture is central to Africa's agenda, it is not sufficient to focus only on production agriculture. Production agriculture must be linked to agribusiness and agripreneurship. Recently, international agencies and African governments have recognised the growing role of agribusiness, as evidenced by a book recently being published, titled "Agribusiness for Africa's prosperity" (UNIDO, 2011), the African Agribusiness and Agro Industries Development Initiative (3ADI) (UNIDO, 2010), and the Strategic Framework for Pillar 2 on markets and agribusiness in Comprehensive Africa Agricultural Development Program (CAADP). Agriculture production and agribusiness together constitute an average of around 45% of the economy of Sub-Saharan Africa. In Sub-Saharan African countries, the share of agribusiness (including logistics and retail) in gross domestic product (GDP) is approximately 20%, while the share of agricultural production is 24% for low income countries, although only a small part of the production is commercialised. Agribusiness (upstream and downstream) from farming accounts for 78% of the total agricultural value chain (logistics, retail, input supply and processing) (Brookfield Agricultural Group, 2010). Many of the agricultural value chains are dualistic, featuring an informal chain serving the lower income consumer in the domestic market, alongside a formal chain with more processing and stronger quality controls for higher income, domestic consumers and /or exports. The structure of the agribusiness is determined by whether the demand for the specific primary agricultural product is for undifferentiated (bulk commodities) or semi-processed products (differentiated primary products) as well as the shelf life of a product (as with fresh fruit, vegetables and livestock products). A major opportunity exists to drive agribusiness development through the development of a new spirit of enterprise, namely "agripreneurship", and the increased individual need for responsibility for running their own business. Many small-scale farmers and extension organisations understand that there is little future for farmers unless they become more entrepreneurial in the way they run their farms. They must increasingly produce more for markets and for profits. Dollinger (2003) defines agripreneurship as the creation of an innovative economic organisation for the purpose of growth or gain under conditions of risk and uncertainty in agriculture. This article aims to emphasise the importance for farmers to be linked to markets to take advantage of the opportunities arising along the agribusiness value chain. Successful entrepreneurship requires a strong enabling environment of which political will and leadership is important but also strong private sector interest. Extension forms part of a set of supporting institutions, which has a critical role to play in supporting farmers to become more entrepreneurial through deliberate innovative actions. Entrepreneurs are individuals who identify creative business opportunities, take the risk of establishing a business, and have talent and skills to manage and grow a business - in the process creating wealth and employment. Entrepreneurs are also innovators, who are looking for better and more efficient and profitable ways to do things (Steyn, 1998). Being innovative is an important quality of a farmer-entrepreneur, especially when the business faces strong competition or operates in a rapidly changing environment (as South African poultry farmers are currently facing with implementation of the Agoa agreement between South Africa and the USA). Can small scale farmers become entrepreneurs? The answer is Yes - all over the world farmers have shown they have the remarkable ability to adapt and they always look for better ways to organise their farms to make a living. However, there is no doubt that smallholder farmers face challenges that are unique and even completely new. For farmers to become entrepreneurs they need to become more market oriented and learn to take calculated risks to open or create new markets for their products. Singh (2013) defines an entrepreneur as an individual who recognises an opportunity or unmet need and takes risks to pursue it. According to the Global Entrepreneurship Monitor (GEM) that measures entrepreneurship activity in 70 countries, the overall entrepreneurial activity expressed as percentage of economically active adults who are involved in total early stage entrepreneurial activity (TEA) as well as established entrepreneurs in South Africa was 10.6% for 2013. This is well below sub-Saharan average of 41%, United States at 21%, and European Union at 15% (Strydom et al., 2016). These authors also identify a spectrum of entrepreneurs and business owners that is significant to consider in venture development. On the one hand, there is the opportunity entrepreneur, motivated by a business opportunity to get started. On the other hand, there is the necessity entrepreneur, who needs to start a business because they have no other choice (therefore starting a business out of necessity for an income as they lack employment). Table 1 illustrates that there are approximately 30% necessity entrepreneurs in South Africa, mainly operating in the informal sector. Entrepreneurial skills and qualities for agripreneurship are considered to be those competencies required to accomplish tasks and activities to ensure that the farm business is growing and developing. Entrepreneurs need more than just their personality or personal traits, they also need a range of competencies, knowledge, skills and behaviours. All entrepreneurs are not the same and there are obviously major differences between entrepreneurs. The critical important skills and success factors for entrepreneurship which contribute to successful business are ingenuity, leadership and calculated risk taking (Strydom et al., 2016). Ingenuity includes knowledge, skills to recognise opportunities, conceptual thinking, understanding of the business environment, creativity. Creativity can involve adjusting or refining existing procedures or products and problem-solving skills. The application of new ideas requires innovative skills. As innovators, they understand the value chain concept and are often prepared to take risks and to invest in goods and services that require high capital investment since they believe the chance to make a profit will outperform these requirements. Successful farmer entrepreneurs are often also strong leaders who display important types of interpersonal behaviour such as motivation, persuasion, commitment, team building, and being goal-focused. One of the critical elements for successful entrepreneurship is good business relations and cooperation with players in the value chain. Entrepreneurs usually have an extensive network of professionals and experienced partners during the establishment phase of the business. McElwee (2006) identified three personality traits that differentiate successful farmers from others. Firstly, they have more initiative than others when new opportunities come along. Secondly, they are focused problem-solvers and have the ability to seize the opportunity. Thirdly, entrepreneurs are not prepared to take chances, but they are willing to take calculated risks. For this to be purposeful, they first determine what the risk entails by evaluating it themselves (doing marketing or feasibility research) or with the help of experts. Furthermore, they manage risk by taking responsibility for control and being involved in the basic aspects of the business (Strydom et al., 2016). They control their business by gaining access to information and calculating the probable outcome before they make decisions. Not all agripreneurs have all these skills, and therefore they need to develop these characteristics with the help of professional support. It is also important to note that these uniquely entrepreneurial skills and qualities are not effective in isolation. They need to be integrated in thought and action. Entrepreneurial farmers combine technical skills, entrepreneurial competencies and their resources to develop new farm business opportunities. Entrepreneurs usually operate in a complex and dynamic environment. They are part of a larger collection of people including policymakers, suppliers, farmers, traders, processors and transporters, each of whom has a role to play in the value chain (Figure 1). A farmer with an entrepreneurial spirit energetically, enthusiastically, but carefully makes different decisions about his farm business in the context of the value chain. Poor or absent basic infrastructure such as poor roads, inadequate opportunities to enter market opportunities, irregular supply of electricity. Unsupportive policy and regulations - land tenure and ownership, complexity of registering business and general bureaucracy. Access to affordable financial support (especially investment capital). Social barriers - the concept of entrepreneurship is not always common to every culture or society. Creativity and innovation are not always valued traits - some governments create social systems that create dependence and hopelessness. Lack of suitable training facilities (right place and time) and offering of appropriate entrepreneurial skills training - specifically with regards to creativity, identifying of opportunities and innovation. Market related risks - the farmer must weigh up the opportunities and risks and decide on the combination of markets to use. Whichever markets they use, farmers face risks to reach them. Lack of support services and trained extension staff - farmers advancing through the five stages of development will require information, advice, training and support. Information needs to be organised, packaged and communicated in ways that are helpful to agripreneurs. Marketing constraints - running a farm business, production must always be linked to market demand and scope. Access to markets are often constrained by factors such as poor communication infrastructure, poor marketing facilities, lack of timely market information, limiting bargaining power, and perhaps negative attitudes of buyers towards farmers. Entrepreneurship depends on individuals understanding cost-benefit ratios, and being able to evaluate the market opportunities and associated risks. Facilitating agripreneurship will also require careful nurturing of grassroots (bottom-up) initiatives, and may also involve the establishment of supporting networks and brokering services. 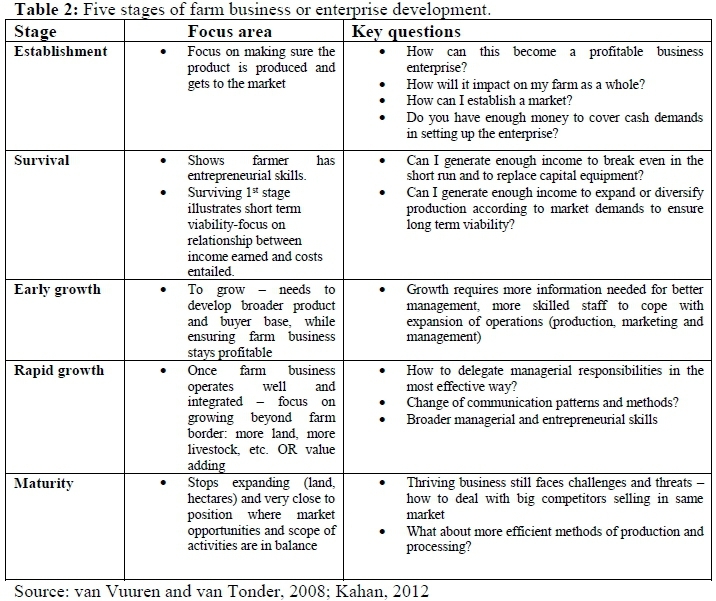 The development of a farm business occurs in five phases, namely establishment, survival, early growth, rapid growth, and maturity (Table 2). Understanding these stages of farm enterprise development helps extension advisors to know when and how to intervene with appropriate support and create suitable opportunities to learn. Farmers require support and advise from extension in identifying goals, as well as for preparing, designing and implementing efficient farm business plans. The advice and support must cover areas beyond production-led services; it must be as wide to include aspects of running a profitable, market-oriented farm business. Competence in the use and application of computers and electronic equipment to access market and technical information. Group or coherent entrepreneurship should be promoted where a producer group or like-minded farmers are willing to work together on a joint venture. These organisations or groups are expected to: (1) stimulate entrepreneurship through provision of information and other advisory and capacity building services; (2) strengthen market (bargaining) power through collective commercialisation and by improving co-ordination between producers; (3) profit from economies of scale through collective storage and processing; and (4) represent farmers' interests in policy negotiations, and dialogue with other agribusiness stakeholders. This often requires extension to support farmers with the mobilisation of the group and facilitate linking farmers to people who can process, package, market and eventually buy the produce along the value chain. It is important to know when to downscale the support to handover the management and entrepreneurial functions to the group. A prerequisite for success is that ownership of the initiative should remain in the hands of the farmers. Farmers can capture more value by producing differentiated commodities (like organic fruit or free-range chicken) for a limited or niche market, or adding value by entering into markets or producing contracts. Since value adding requires knowledge and understanding of the value chain and its bottlenecks, extension officers can support farmers with identifying, investigating and evaluating opportunities. One way of growing is the changing production systems to produce for specific market demands by developing or adapting new technologies and innovative practices. Extension officers should encourage farmers to innovate where required and share these experiences with other farmers. Information Communication Technology (ICT) like smartphones, tablets and other computer-based systems are powerful tools to educate and inform farmers about new ideas, technologies and practices (especially where budgets are limited, and transport availability is challenging). It can be harnessed for the benefit of both farmers and extension without compromising the importance of human and unique local factors. Successful farmer entrepreneurs are strategic in their planning and implementation of plans ("big picture thinking"). They look at their farm business from a holistic and long-term view, and make sure that major farm business activities and aspects compliment the objectives and goals they have set for the business. They look at ways to strengthen the competitiveness of the farm business through satisfying potential buyers, achieving performance targets, and staying focused on the long-term goals of the business. Extension should support farmers in planning a long-term strategy for the farm business, help with implementing and monitoring the outcomes, and where required to adjust when conditions change, support the farmer with decision making. Facilitating the learning process is an important role that extension advisors should play, as many of the farmers are not aware of the need to develop their entrepreneurial competencies and skills. However, the majority of extension advisors in South Africa are trained in specific technical areas of agriculture, and therefore themselves need specialised training in order to become effective trainers and facilitators of entrepreneurship. Although extension advisors perhaps cannot do the actual training in entrepreneurship, they can still exchange experiences, share information, and participate in joint problem solving. They can assist farmers to link up with the right support institutions and individuals who have the necessary expertise to deal with the concerns. As the farm business grows, effective communication becomes especially important to increase an understanding, cooperation and mutual trust. Some farmers find the transformation from a small informal business to a larger, more formal business structure daunting. Being used to hands on management of day-to-day operations and making all decisions, the agripreneur may find delegating of decision-making challenging. Extension should be geared to offer training programmes where farmers are helped to become more aware and understand the transformations required (personal and business transformation). This will help farmers to prepare themselves emotionally, behaviourally and technically for the change process. Finally, extension is absolutely important to support farmers after completing entrepreneurship training programmes. Entrepreneurship skills can be best learnt by doing. Learning happens through a process of discussion, acting (practise), and reflecting. This learning cycle equally applies for farmers when solving problems on the farm, and this process can sometimes be challenging which requires continuous support and guidance. Behind each of the success stories of entrepreneurship there is usually some sort of institutional support. Besides the entrepreneurial spirit of an individual or group of individuals, the enabling environment supporting these initiatives is of utmost importance. The existence of such an environment largely depends on policies promoting entrepreneurship and the set of institutional support in place. 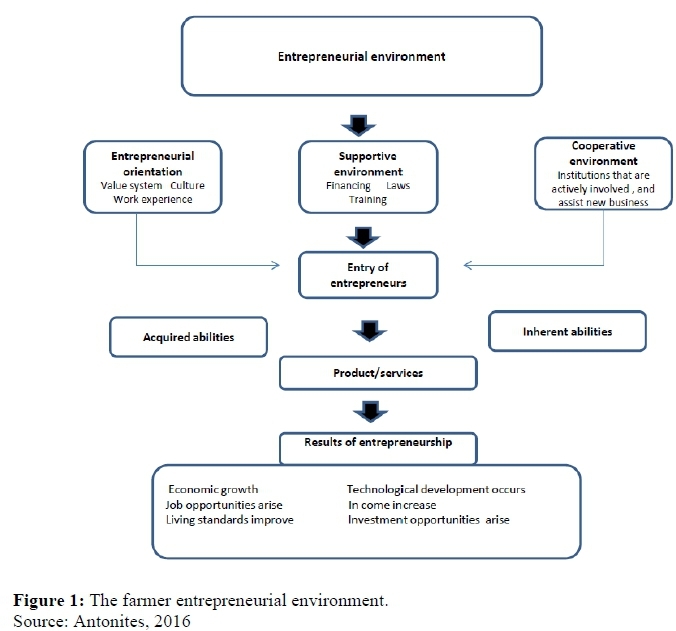 The effectiveness of such policies depends on the conceptual framework about entrepreneurship (what it is and how to foster it), and a strong political will that entrepreneurial development is a strategic intervention for farmer development (with China and India as good examples to illustrate this point). Therefore, it is absolutely essential that government and donors invest in infrastructure, but also in the set of institutions that are required to support agripreneurship. Extension has a critical role to play in the fostering and development of agripreneurship. However, to be able to act in this direction, I believe we must become entrepreneurially minded. We must be able to see agricultural production as one of the factors contributing to the farm business. Lastly, the agricultural environment has changed globally and also in South Africa, and the question is whether extension is willing to change the approach being practised for the last 22 years. We can no longer ignore the changes that are occurring in the agricultural environment.